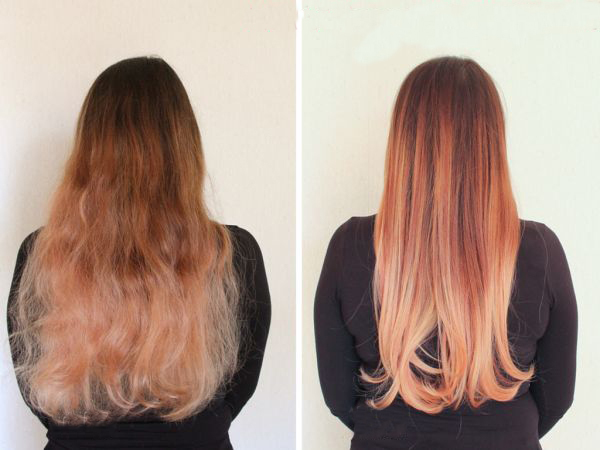 How to repair damaged hair after hot dyeing? How can you tell if your hair is good or bad? can not be absorbed, bifurcation, yellow, dry problems follow. 2. Selection of shampoo is the most important step, according to the degree of damage to their own hair using a targeted shampoo. shampoo and conditioner is the best of the same series of products, As a daily care, shampoo and conditioner can not be ignored. 4. As far as possible control the number of hair dyed. In addition to the sun and dust, the biggest damage to the hair is dyed and hot, hot too often will hurt the number of hair. 5. If you want to dye hot, be sure to use a professional dye products, professional dye products can burn the hair damage to a minimum. 6. dye hot water after the most important. Even the best syrup, will cause damage to the hair, daily care must give hair to increase nutrition. 7. Selection of non-alcoholic stereotypes products. 8. Shampoo with warm water to wash hair, to avoid hot water damage to the hair, make hair loss of toughness and luster. 9. to deal with serious damage to the hair, the best way is to cut off. Hair bifurcation, and do more on the nutrition in fact no use.